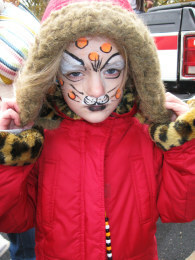 My daughter had her face painted at a family-fun day. I asked her to hold on to her hood so the fur offset the face! Such a gorgeous little pic. Join in and write your own page! It's easy to do. How? Simply click here to return to Photography Poses.